A puzzle is a game, problem that tests a person's ingenuity or knowledge. Here we have selected some really interesting puzzles for you. More you solve these puzzles, more you love to solve more. Cross-shaped box: The diagram below shows a cross-shaped box containing three numbered blocks. The puzzle is to slide the blocks around the box until the numbers read 1,2,3 as you go down. 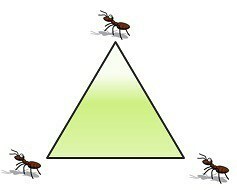 Ant and Triangle Problem: Three ants are sitting at the three corners of an equilateral triangle. Each ant starts randomly picks a direction and starts to move along the edge of the triangle. What is the probability that none of the ants collide? Crossing the Bridge Puzzle: Four people need to cross a rickety bridge at night. Unfortunately, they have only one torch and the bridge is too dangerous to cross without one. The bridge is only strong enough to support two people at a time. Not all people take the same time to cross the bridge. Times for each person: 1 min, 2 mins, 7 mins and 10 mins. What is the shortest time needed for all four of them to cross the bridge? Heaven’s Gate Probelm: You are standing before two doors. One of the path leads to heaven and the other one leads to hell. There are two guardians, one by each door. You know one of them always tells the truth and the other always lies, but you don’t know who is the honest one and who is the liar. You can only ask one question to one of them in order to find the way to heaven. What is the question? If you like these puzzles comment below or share your feedback about this here.